Has the ICC struck a blow against impunity or heightened tensions—or both? By the time International Criminal Court prosecutor Luis Moreno-Ocampo held a press conference in The Hague in December 2010 to announce that he was charging six Kenyans with crimes against humanity, speculation about the names on his list had been rife here for months. At the newspaper where I work, various reporters claimed to have it on good authority that such-and-such a person would be cited as having played a key role in the violence that followed the contentious 2007 presidential election. Security was stepped up in areas thought ripe for a renewal of the fighting, which had left more than 1,000 people dead and brought former UN Secretary General Kofi Annan to town to broker a peace agreement. Having lived through the post-election period, I couldn’t help being a bit nervous. In the end, Kenyans’ good sense prevailed; even the area that had experienced the most vicious attacks remained calm (those attacks, while triggered by the disputed election, can be traced back to longstanding land disputes between members of the Kalenjin and Kikuyu communities). But the ICC process—the prospect of which had been roiling the country since Annan threatened to involve the court if Kenya didn’t set up a credible tribunal itself—was only getting started. Now that the country has been plunged into full-on campaigning for the next presidential election—currently scheduled for March 2013, though the date is still being disputed—the ICC looms ever larger in public life. Every twist and turn of the ICC process has been the stuff of high drama: thanks to live televised pre-trial proceedings, Chief Judge Ekaterina Tredafilova became as well known as Kenya’s top soccer stars, and bitter battles have erupted in Parliament over the question of whether anyone charged by the ICC should be allowed to run for president. This latter is an issue of considerable relevance, since two of the four people now awaiting trial (charges against the other two were not confirmed) are presidential aspirants. One, Deputy Prime Minister Uhuru Kenyatta, is the US-educated son of the country’s first president. The other, William Ruto, is a prominent member of Parliament. The two have been traveling the country together holding “prayer meetings” at which their supporters portray them as victims of a neocolonial effort to subjugate Africa. In March the rhetoric ratcheted up another notch when Prime Minister Raila Odinga, believed by many to have been the real winner of the 2007 election and running again for president, accused Kenyatta and Ruto of “damu mkononi” (having blood on their hands), while MP Cecily Mbarire described the ICC as “a slaughterhouse” and urged Kenyatta to ignore any summons to the court. Then, in late April, President Mwai Kibaki launched an effort to get the ICC cases shifted to the East African Court of Justice, a move condemned by critics as a last-ditch attempt to shield the four suspects. This, in short, is what the impact of the ICC looks like on the ground: front-page headlines, political theater, and nasty exchanges that heighten the tensions between ethnic groups. 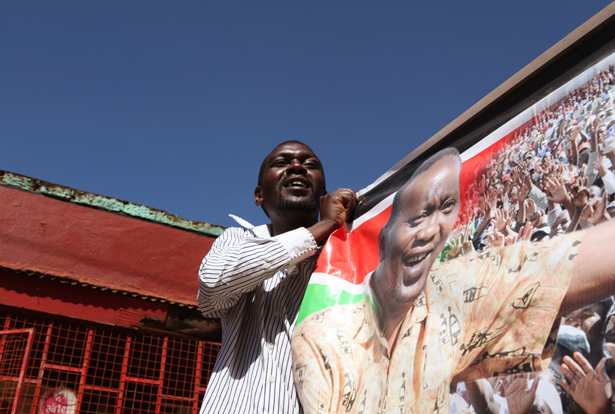 “The ICC’s actions are now in effect an inescapable element of the political process as Kenya heads to elections,” the International Crisis Group wrote in a January policy briefing. None of this is good for business. Jaindi Kisero, a leading economic commentator, predicted just before the ICC announced the names of the accused that “until we successfully undergo the [ICC] process, the macroeconomic environment will remain covered by dark clouds. Investors abhor political uncertainty and unpredictable situations.” In late April Kenya’s Business Daily reported that in recent months the country’s perceived level of risk for investors has been adversely affected by factors including “increasing tensions” over the ICC prosecution. Such instability is doubtless not what the creators of the ICC envisioned. Likewise, it’s not what the more than 100 countries that have endorsed the court (including Kenya) expected when they began to sign on more than a dozen years ago. But it is what I see around me every day, and it has brought home how easy it is to get swept along by intellectual currents—maybe I mean intellectual fashions—without fully appreciating where they may take us. In 1993 the New York Times endorsed the concept of an international criminal court as a method of trying people “who flout globally recognized standards of behavior.” In early 2001 The Nation applauded President Clinton’s signing of the treaty (later renounced by the Bush administration) and placed it in a line of progressive international accords. To the best of my knowledge, however, no one at the time talked about what ICC actions might mean for countries caught up in them, especially in cases where prominent people are involved. Kenya thus offers important lessons, whatever the outcome of the current prosecutions. Kenyans remain generally positive about the ICC. A December poll showed support at 54 percent. But that support has been steadily dropping (it was 68 percent in mid-2009), which reflects a growing unease. Recently I met with a group of Kenyans brought together by a friend who, like them, attends a church not far from where I live. It’s in a poor neighborhood whose main thoroughfare is lined with dusty shops selling vegetables, household goods and phone cards. But the church sits in an attractive compound that, on a Saturday afternoon, was a busy mix of people building a new church hall, tending flower beds or otherwise helping out. Njoroge’s relatives were originally from the central province of Kenya but had been living among people of another ethnic group for several generations when the violence erupted. It was not the first time there had been trouble, he noted; in 1992 and again in 1997 there had been clashes prompted by disputes over land, but they were “mostly wars of words.” After the 2007 election, however, armed men threatened his family and neighbors and burned their houses to the ground. Nicholas Yego, 29, said that at first he, like Njoroge, was optimistic about what the ICC could accomplish and was ready to see the alleged leaders of the violence summoned to The Hague. “I felt, let them go and defend themselves,” he said. But over time, he came to believe that “the ICC was mostly targeting Africa,” which made him begin to question its proceedings. Yego’s comments point to one of the most serious problems the ICC has in Kenya: the perception that it is a Western project aimed at Africans. Even people who strongly support the ICC say the organization has played into these perceptions by choosing Kenya as its first ICC-initiated case, even though it’s never had a single non-African case before it. (Other prosecutions, such as that of Congolese warlord Thomas Lubanga, who in March became the first person convicted by the ICC, were referred by the UN Security Council or by the countries themselves). I suspect that the ICC’s choices of whom to go after stem not from a conscious targeting of Africa but rather from the assumption that underlies much of the West’s interaction with the continent: these people need our superior wisdom and “help.” Of course, serious human rights violations have occurred. But after five years of watching Western ambassadors wag their fingers and NGO officials make condescending remarks, I am led to wonder whether the ICC—and indeed the whole international human rights industry—automatically looks to Africa as the obvious place to focus its efforts. Probably the American with the most informed vantage point on the ICC’s activities in Kenya is Ron Slye, the neighbor I mentioned earlier. A law professor at Seattle University, he’s the only non-African member of Kenya’s Truth, Justice and Reconciliation Commission, set up as part of the 2008 peace accord. The TJRC has spent much of the past three years taking testimony from Kenyans affected by the post-election events and earlier incidents of inter-ethnic-group violence. While the commission is not connected to the ICC, it has grappled with many of the problems that form a historical backdrop to the international court’s cases. Slye says he believes the ICC’s intervention was justified, given that Kenya had demonstrated that it lacked the political will to punish those responsible for the violence (a recent Human Rights Watch report found that in one hard-hit district, there had not been a single conviction in the 230 cases involving post-election killings). “It was clear government wasn’t going to do anything,” he said. At the same time, however, Slye says he recognizes that there are costs, including possible disillusionment: “The ICC is more victim-oriented than many judicial proceedings, but it’s still more focused on criminals than victims. You have an enormous number of citizens who have been assaulted, raped or killed,” he added. “These people might see the ICC as often more interested in prosecutions than in helping them.” For that reason, he says, it’s important to pursue what he calls “restorative justice” through such means as the TJRC at the same time that criminal prosecutions are under way. The campaign for Kenya’s next president is likely to coincide with the trials of the people against whom charges were confirmed, unless their current appeals are more successful than previous ones (the judges for the trials have been announced, but the dates have not yet been set). Given that fact, the ICC will continue to play a major role in the country’s public life. I hope he’s wrong. I also hope that the ICC will grow into a universally well-regarded institution and that future Kenyan historians will conclude that, all things considered, it benefited the country. Right now, however, I would say that on all counts, the jury is still out.